It’s high time UN agencies and the mainstream media acknowledge the true scale of global poverty and engage in a long overdue public debate on how ambitious and transformative the international development agenda really is. As the star-studded endorsements and media hype surrounding the all-pervasive Global Goals campaign begins to subside, a very different truth is beginning to emerge about this latest attempt by the international community to end poverty and create an ecologically viable future. Despite the UN’s ambitious claims, all the indications are that the Sustainable Development Goals (SDGs) do not have the potential to “free the human race from the tyranny of poverty and want” or “heal and secure our planet”. On the contrary, the ‘new agenda for development’ fails to address the root causes of today’s interconnected global crises, perpetuates a false narrative about poverty reduction, and reinforces an unsustainable economic paradigm that is inherently incapable of reducing the true scale of human deprivation by 2030. If taken at face value, it may seem irresponsible for anyone to dismiss the broad vision and prime objective of the SDGs to “end poverty in all its forms everywhere” – if only because it presents a valuable opportunity to improve intergovernmental cooperation and focus both political and public attention on pressing global issues. As Share The World’s Resources have outlined in a recent report, however, there are many reasons to question not only the targets themselves, but the entire sustainable development initiative and the political-economic context within which it will be implemented. For example, one of the key concerns that emerged from the Financing for Development talks that accompanied the SDGs negotiations was whether governments will be able to raise and redistribute the huge sums of money needed to meet the goals – especially given that developing countries face an estimated annual gap of $2.5 trillion in SDG-relevant sectors. Even though levels of international aid still fall far short of the 0.7% of GDP that donor countries have repeatedly pledged for more than 45 years, governments attending the financing talks failed to agree any concrete measures for redistributing more of the world’s highly concentrated wealth to protect the most vulnerable people. Instead of agreeing to provide significantly more funding for development, donor governments pushed for countries in the Global South to take greater responsibility for mobilising finances domestically. At the same time, they effectively refused to implement any of the urgent measures that civil society has long been calling for to prevent illicit financial flows, tackle tax avoidance or restructure external debts – measures that could mobilise many billions of dollars in additional revenue each year for low-income countries. Until these critical issues are addressed, foreign aid will continue to be dwarfed by the net flow of financial resources from the Global South to the North, which suggests that in reality the populations of (resource rich) low-income nations continue to finance the development of ‘rich’ nations rather than the other way around. Another major critique widely voiced by environmentalists is that the SDGs encourage governments to maintain their obsession with putting economic growth before pressing social and environmental concerns. In particular, SDG 8 is entirely devoted to the promotion of “sustained, inclusive and sustainable economic growth”, even though there is now ample evidence to suggest that relying on the trickle-down of global economic growth is not an effective way to end poverty. Many campaigners have cited detailed projections by David Woodward (based on optimistic assumptions about future rates of global economic growth), demonstrating that it would take at least 100 years to ‘eradicate’ poverty at the $1.25-a-day level and twice as long at the more appropriate $5-a-day measure of poverty. Far from promoting a truly ecological agenda for development, the SDGs reflect the widely recognised and profound contradiction between the pursuit of economic growth and the very notion of sustainability. Not a single country has managed to ‘decouple’ economic growth from environmental stress and pollution, and achieving any significant level of decoupling remains highly unlikely in the foreseeable future. Indeed, evidence suggests that accelerating economic growth in order to speed up poverty reduction will result in a rise in global carbon emissions that would wipe out any possibility of keeping climate change to within the ‘acceptable’ margin of a two degrees centigrade increase. However much we would like to believe that governments are on track to end poverty by 2030, a more detailed examination of the available data shows that the received wisdom about our economic progress is largely based on misdirection and exaggeration. 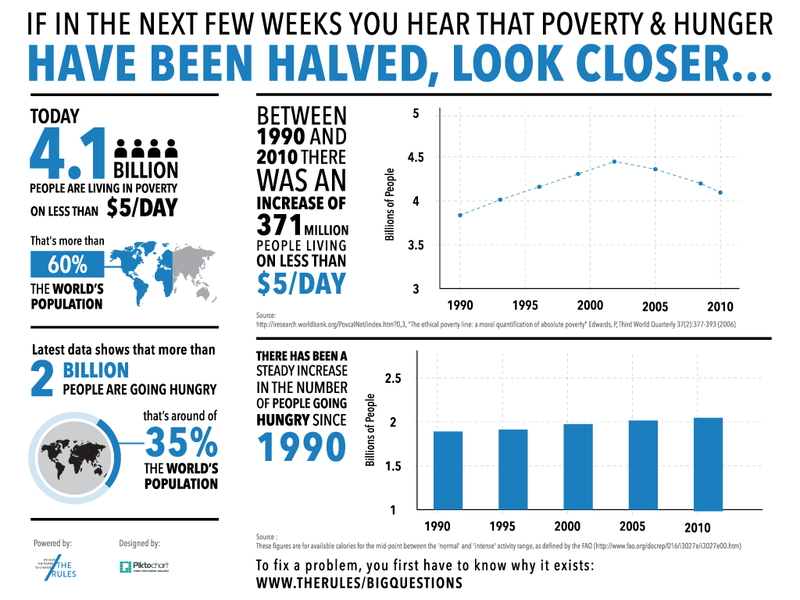 According to official UN statistics, there has been a steep drop in global poverty levels over the past 25 years. In 1990, around half of the developing world reportedly lived on less than $1.25-a-day – a figure that reduced significantly to 14% by 2015. According to new data just released by the World Bank, these numbers have diminished even more rapidly in recent years with as little as 10% of the world’s population now living in poverty. However, there are serious concerns around how changes to the way poverty is calculated have contributed to the illusion that poverty significantly reduced as a result of the Millennium Development Goals. Most significantly, the baseline year for measuring progress was shifted back to 1990 in order to include all the poverty reduction that took place (mainly in China) well before the Millennium Campaign even began. On more than one occasion, changes to the way the poverty line was calculated meant that hundreds of millions of people were subtracted from the MDGs poverty statistics overnight. The World Bank’s definition of what constitutes ‘extreme’ poverty is also widely regarded by economists as highly problematic. According to the Bank’s latest revision, this all-important measure is now based on an international poverty line of $1.90-a-day (previously $1.25-a-day). This exceedingly low and highly contentious poverty threshold reflects how much $1.90 can purchase in the USA but not in a low-income country like Malawi or Madagascar, as is often believed. It’s clear that meeting even the most basic human needs for access to food, water and shelter – let alone paying for basic medical services – would be impossible to achieve in the United States with such little money. In comparison, the official poverty line for people who live in the United States is set at the substantially higher rate of around $16-a-day. At the very least, this behoves the World Bank and the SDGs to adopt a morally appropriate dollar-a-day poverty line that accurately reflects a minimum financial requirement for human survival. This is a view shared by the United Nations Conference on Trade and Development (UNCTAD) who argue that only by using a higher threshold of $5-a-day would it be possible to fulfil the right to “a standard of living adequate for… health and well-being” – as set out in Article 25 of the Universal Declaration of Human Rights more than 65 years ago. According to World Bank statistics, poverty at this slightly higher level of income has consistently increased between 1981 and 2010, rising from approximately 3.3 billion to almost 4.2 billion over that period. If the Millennium Campaign had used this more appropriate poverty threshold, MDG-1 would clearly not have been met: rather than halving the number of people living without sufficient means for survival, there are 14% more people living in $5-a-day poverty now than in 1990. As ActionAid and others rightly suggest, however, a $10-a-day benchmark may be a far more a realistic measure of poverty when comparing lifestyles in rich and poor countries, which would mean that an alarming 5.2 billion people live still in poverty today. There can be little doubt that the mainstream narrative about how global poverty is being dramatically reduced distracts from the need to address its structural causes and diffuses public outrage at what is, in reality, a worsening crisis of epic proportions – one that demands a far more urgent response from governments than the SDGs can deliver. At the very least, adopting a more realistic international poverty line would transform our understanding of the magnitude and persistence of poverty in the world, and spark a long overdue debate on how ambitious and transformative the international development agenda really is. While such critiques of UN poverty statistics are necessary to highlight the truth about global poverty levels, this still doesn’t fully illustrate what life-threatening deprivation means in human terms, especially for those of us living in affluent countries who have little or no contact with the world’s poor. World Bank figures conceal a disturbing fact about what it really means to forgo access to life’s essentials: according to calculations by Dr Gideon Polya, over 17 million ‘avoidable deaths’ occur every year as a consequence of life-threatening deprivation, mainly in low-income countries. As the term suggests, these preventable deaths occur simply because millions of people live in conditions of extreme deprivation and therefore cannot afford access to the essential goods and services that people in wealthier countries have long taken for granted. The extent of this ongoing tragedy cannot be overstated when approximately 46,500 lives are needlessly wasted every day – innocent men, women and children who might otherwise have contributed to the cultural and economic development of the world in unimaginable ways. This annual preventable death rate far outweighs the fatalities from any other single event in history since the Second World War, and around half of those affected are young children. Given today’s technological advancements and humanity’s combined available wealth of $263 trillion, it’s perhaps no exaggeration to suggest that the magnitude of these avoidable deaths is tantamount to a global genocide or holocaust. What, then, should be our reaction to the sheer extent of life-threatening deprivation in the world, given that our combined efforts to meet urgent human needs – as expressed by the actions of our elected governments – are tragically inadequate on a global scale? It’s surely futile to direct further policy proposals or alternative ideas to the world’s governments, who are failing to enact the emergency measures and far-reaching structural reforms that are necessary to end extreme poverty within an immediate time-frame. Instead, civil society groups and engaged citizens should adopt a strategy for global transformation based on solidarity with the world’s poor and a united demand for governments to radically reorder their distorted priorities. STWR’s founder Mohammed Mesbahi has proposed such a strategy for redirecting public attention towards the shameful injustice of this growing humanitarian crisis, based on the need for governments to finally uphold the long-agreed entitlements set out in Article 25 of the Universal Declaration of Human Rights as their leading concern in the period ahead. As Mesbahi explains, the time has come for millions of citizens in every country to collectively demand the universal realisation of these basic rights – for adequate food, housing, healthcare and social security for all – until governments significantly reform the global economic system to address the root causes of hunger and needless poverty-related deaths. With over 70% of the global population struggling to live on less than $10 per day, there is no doubt that a common cause for guaranteeing basic socio-economic rights across the world could bring together many millions of people in different continents on a common platform for transformative change. If these public protests can become the subject of mainstream political and media discussions, people from all walks of life may soon be persuaded to join in – including those who have never demonstrated before in the richest nations, along with the poorest citizens in low-income countries. Needless to say, galvanising an informed public opinion the world over is a formidable challenge given the false mainstream narrative on poverty reduction and a general lack of popular awareness within affluent society. But without a collective worldwide awakening to the injustice of widespread poverty amidst excessive wealth inequalities, it may remain impossible to overcome vested interests and the political inertia of governments. The responsibility for change falls squarely on the shoulders of us all – ordinary engaged citizens – to march on the streets in enormous numbers and forge a formidable public voice in favour of ending extreme human deprivation on the basis of an international emergency.